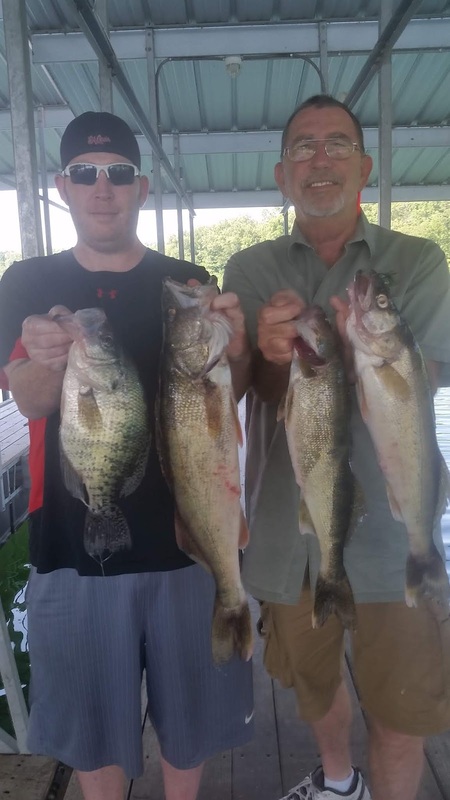 Norfork Lake fishing is continuing to be outstanding. There is still a little topwater action right before sunrise and then again at sunset. Hybrids, whites, largemouth and smallmouth bass are the fish coming up sporadically. Most species are located from about 18 feet of water out to 70 feet of water. 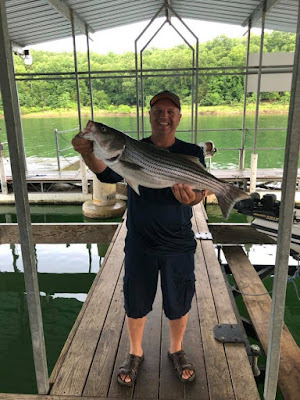 The striped bass and hybrid bass bite is one of the best bites I have seen in awhile. This species has started to school which makes it a lot of fun. When you find the school of fish you have continuous action until you loose the school, then you are back to looking. Live bait is working very well, but artificial baits are working as well. 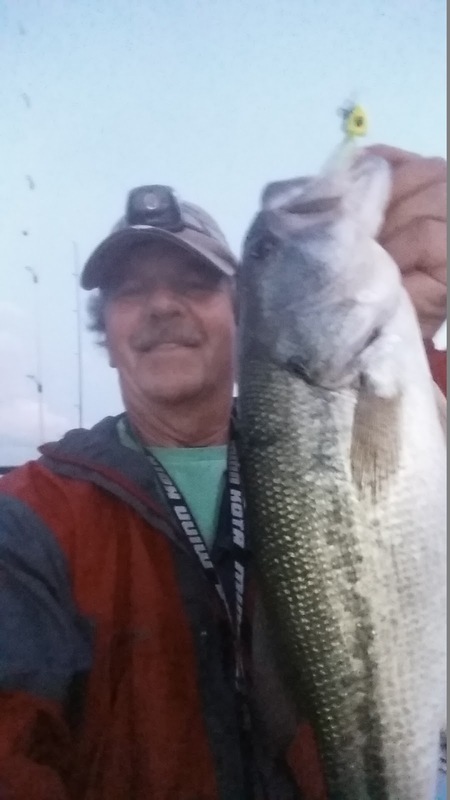 Vertical jig with a spoon, cast out a big swim bait and cast or troll an Alabama rig. What I have noticed over the last week is that the fish I mark from the surface down to approximately 30 feet are predominately hybrid and white bass. The large arcs marked from 40 to 70 feet are typically striped bass. 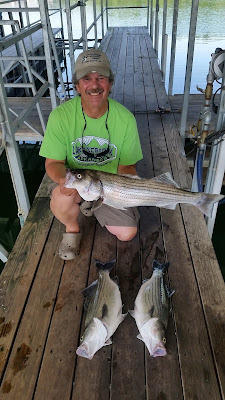 Striped bass need the cooler water whereas the hybrids can tolerate the warmer water. I have been vertical jigging with a spoon for the deeper fish as these are the big boys. This morning I had my spoon down 65 feet in 70 feet of water and I hooked into something big. It would not budge, but then I felt a head shake and it started to move slowly along the bottom. This fish could care less that it was hooked. I fought this fish for about 5 minutes then the treble hook just pulled out. I will get this monster the next time. :-) The best locations at this time are part way back in creeks whether it be a major or a secondary creek. The striped and hybrid bass are feeding on crawdads during the evening and are switching out to shad when the sun starts to come up. The best depths where I have found the fish is from 50 - 100 feet of water. 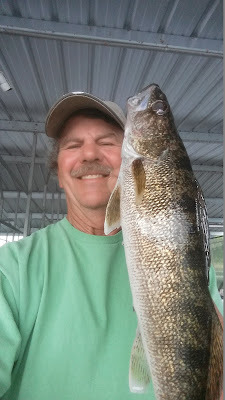 The walleye bite is also very good. Most of the fish that my guests and I have caught are in 20 - 30 feet of water on the bottom. During the night if you are using a light to attract bait you will find this species suspended down about 20 feet. A crawler harness with a bottom bouncing weight is working very well, but I have caught my walleye jigging with a spoon on the bottom. 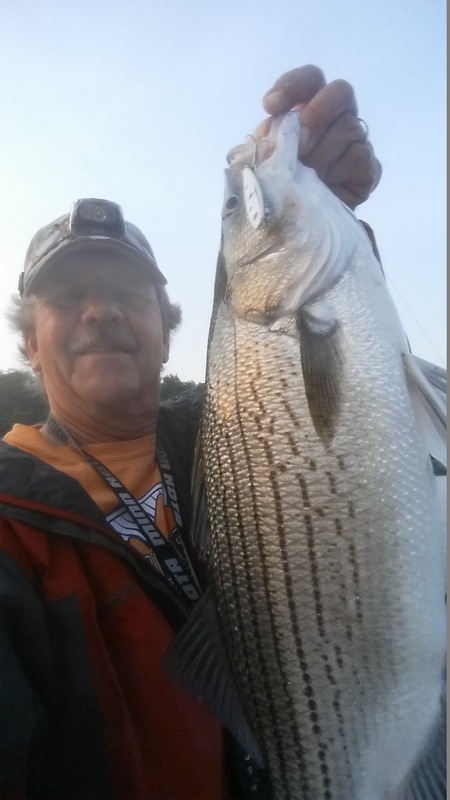 Live shad or shiners are also picking up some nice fish especially after dark. 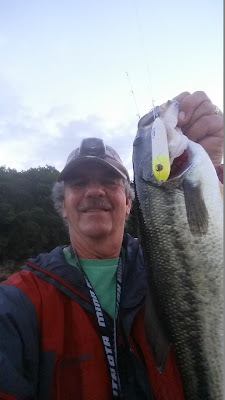 The largemouth bass bite has been good especially early and late in the day. Some topwater action up close to the bank, as well as, out in deep water while they are chasing shad. I have caught some nice fish on Zara spooks, swimbaits and a blade type bait. As the sun gets high in the sky switch out to baits you work along the bottom in 15 - 25 feet of water. You will also still find some nice fish up in the sunken buck brush, but most are deeper. The crappie bite is good if you can locate the fish. This is the time of year when they scatter into deeper cooler water along bluff drop-offs or inside of deep brush piles. 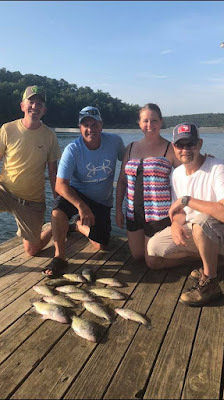 The best bite for crappie has still been in the shade of covered docks. The Norfork Lake level is falling approximately 2 - 3 inches per day and currently sits at 561.5 which is only about 5 feet above normal seasonal pool. The surface water temperature is holding fairly stable and is currently in the mid 80's. The main lake is clear with a slight stain back in some of the coves. The lake is in absolutely great shape. 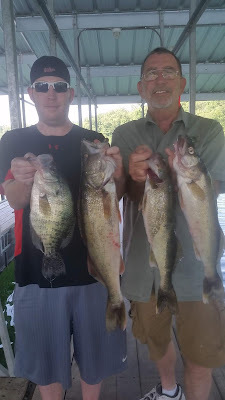 If you have not made your plans yet for your summer fishing and/or lake recreation vacation give us call. 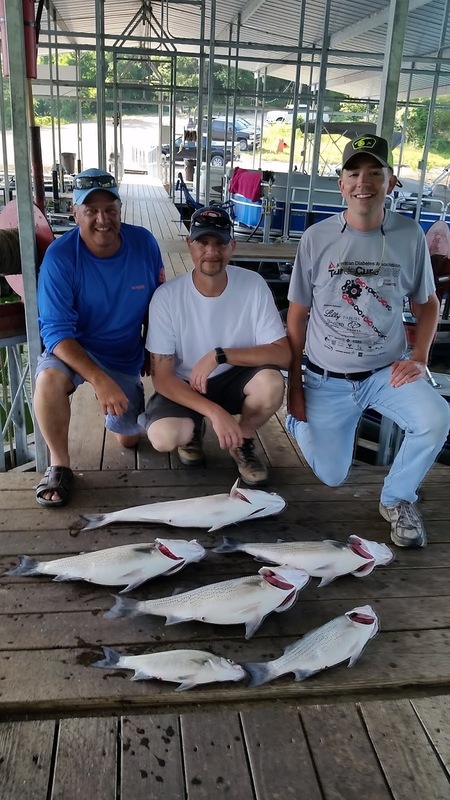 We have cabins available 870-492-5113.